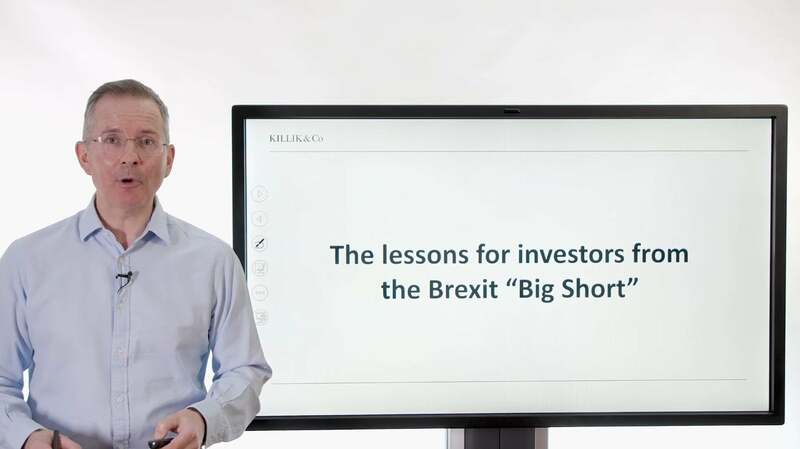 The Lessons For Investors From The "Brexit Big Short"
A small group of big investors made a fortune from the referendum result in 2016. Tim Bennett explains how and sums up the wider implications in 2019. Welcome to this Killik explains finance video. This week a topical one. The B word is in that lessons for investors from the Brexit Big Short. What was it going to go back in time a little bit. And why does it matter when you do a little bit tired off the whole. How's this going to work. DEBATE THIS IS IMPORTANT. This affects the way that markets work potentially and puts a little bit of emphasis on the regulator in terms of getting a grip on this type of stuff. So here we go the background is wall while as we all know the 2016 run result came in to leave and essentially that surprised quite a few people. It certainly surprised the currency markets the pound lost 8 percent a record in a single session as a result. So the pound crumbled. Now a few large hedge funds made profits. And the question is how are there are two layers to the how one is the mechanics mechanically how do you make money on the poles. And then the second thing is how do you know you're going to make money when something falls. Now the argument goes markets are completely level playing fields. You can win you can lose from placing a down Bet. But a group agendas of Bloomberg think that actually the playing field wasn't as level as you might think. Now the basic mechanism is Walt. So this is the first how so they met this crucial selling a couple that more detail in other videos I'm not going to go into detail here but suffice it to say there are always placed large bets on things voting as a conventional investor you tend to think the way to make money is to buy low sell high. But trust me there are all ways to do it the other way around. Again using derivatives using short selling as it's gold. So let's assume these big players these hedge funds Raybold placed large bets own Sterling Folino as they make money. If that proved to be correct. Now no one has the benefit of your foresight to know what's going to happen. Let's say there is a way you can achieve that. And these are good. In other words every pound if you like you place a bet on sterling falling. The effect is magnified. So you make a lot more than one pound profit OK. Now there is about naturally as about as it is not a free lunch. Betting on falling prices is both on populism Dymes seen as negative and it's pretty risky. Get it wrong you can bust your fund because basically these a good bet and magnified and get the direction of travel Rome had the pound risen sharply. You can be wiped out with Besse of this kind of magnitude. So remain was officially tipped when the but. Now that's worth remembering even though of the entire negotiation that resumes it has been about leaving it's worth remembering that remained was tipped to win. Will it be before that will be the case. Short sellers therefore needed định that it was to banks against the crowd. You've got to be fairly confident or nuts on these people were probably the former rather than the latter. So what would that age be. And is this exit polls in other words how do you gauge what's going to happen on Middle East and how do you bet confidently against the consensus opinion. Well large polling agencies were retained by the hedge funds. Now this is the other accusations were the wrong word amies fact that these large polling agencies of a size that normally would be associated with making some sort of public prediction the night it was saying it's too difficult to call. We're not prepared necessarily to say which way we think the the referendum result is going to go. So rather than actually saying we're not going to attempt it at all. What it seems was happening was they were basically on the payroll of certain hedge funds who were interested in that information so publicly these two or three big agencies were normally associated with giving predictions on things like referendum results were strangely quiet behind the scenes is the accusation you are being paid to do exactly that. And that evidence that Leib would win early in the evening that they couldn't possibly know definitively and this is almost a defence if you like but based on incredibly sophisticated data that they were able to practice on fraud and things like talent competitions on national TV for example where they were asked to try and predict winners and losers based on a sample of people extrapolate to a wider population using some pretty cutting edge sophisticated statistical techniques picking the right sample of people was if you like they had reasonably good evidence insofar as anyone does that leave would win early in the evening and that was important because that was evidence they had that not necessarily anyone else but you and I had access to now. Double whammy was the double whammy. So how do you make hundreds of millions vast amounts of money out of a risky bet on the back of that information. Well basically if you know if you can see the pound rising as people think it's going to go remain so that basically underpin the pound send it up you know that at some point will be a tipping point.